The Latina Book Club congratulates Eddie H. Cisneros on realizing his dream of becoming a published author. We are happy for the chance to chat with him about his writing and his debut novel, HIS-PANIC, our selection for June's Book of the Month. Q: You are a writer who works as a doorman. Tell us about yourself, your family and when you knew your passion was writing? EDDIE: I am employed as a doorman. This month, will mark 21 years at the same position in the same building. I currently reside in Queens with my wife, two kids and my super, super pal, our dog. I've been writing for quite some time. I've had a passion for writing going back to when I was really young. It was just something I enjoyed doing, the entire thought process and the creativity bundled with a vivid imagination I guess. Growing up, I really enjoyed watching movies and would even try and write scripts for movies that my friends and I had in our minds to film in our neighborhood. In my teen years, writing turned towards music and taking a stab at a rap career, which resulted in several demos but nothing furthermore. A bit older now and I am back to writing scripts, serving as a contributing writer for a real estate website, and more recently, writing the novel series of HIS-PANIC. Q: Congratulations on your debut novel, HIS-PANIC. Tell us how you got the idea for Antonio Pintero. What is his story? How did you decide on the title? EDDIE: Again growing up, I wouldn't say I was raised in this hugely bad area or anything considered to be the "ghetto" but you still saw things. I knew people, still know individuals who dabble in the let's say, "street way of life." I was taught, while taking a writing course for Gothic Writers Workshop, that the best writing comes from what one knows. Therefore, I believe the sheer vividness of the book bundled with my imagination, kind of brought out the character of Antonio Pintero. He's this fascinating character that at the same time is this enigma, if you will. Throughout the series, he's conflicted with different types of emotions but they're unfortunately based around events and things that he's been exposed to in his life and because of this, he is the way he is. I firmly believe that readers will connect with his character on different levels. In the street sense, yes, Antonio becomes this big figure in the drug game. But in all, he's this emotionally scarred individual who grows up and lives a good portion of his life without faith, and this becomes a very big part of the final parts to the series. As he gets older, he seeks to try and right certain things that he's done wrong because he feels time is running out. As far as what ultimately happens to Antonio, readers are going to have to tough out the entire series. The title is simply a pun on words: Hispanic, for the main character being a Latino. But, because the series involves the life of a drug dealer, you then get HIS relating to anyone. And the word Panic, describing fear within that world and way of living. Q: We understand that HIS-PANIC is a series. How many books are you planning? What will happen to Antonio? Are you writing anything else? EDDIE: The series in all, is really four books, but because of the size of them, basically all coming in at around four hundred pages each, it was best decided to try and break them down. So, in keeping with parts, it may look to be eight books in the entire series. I may have answered this next part in the second question, regarding Antonio's outcome? Let's just say he goes through an epiphany and realizes that some things in life maybe shouldn't be the way they are. Basically all of us have the power to carve out our own destiny by the decisions we make. And that, is the true basis as to what HIS-PANIC will finally be about. At the moment, I am working on the last installment of HIS-PANIC, but I do have two completed screenplays. I also served as a contributing writer for the website Brickunderground.com, and I have amassed over 40 articles in a course of about a year and a half. Q: Who are your favorite writers? Favorite Latino writers? Your favorite books? EDDIE: I am a big horror fan, so I would have to say Steven King. But I have read and enjoyed in my time, all types of writers. I have kept close watch with Sandra Cisneros, (we're not related because of the same last name), Charles Rice Gonzales and even Jerry A. Rodriguez' THE DEVIL'S MAMBO. Q: What do you think of the We Need Diverse Books movement? How can Latinos be better represented in books? EDDIE: I actually have been reading more on it. Love the idea of children's books having an injection of various flavors. By that I mean, on a personal level, I went to an elementary school and had friends and classmates that were all mixed, be it White, Black, Hispanic, Indian, Asian etc. I fully believe that in keeping with that idea, children's books and even adult ones, should really lend voices to different types of people. It's what keeps cultures alive. As for Latinos, I know my book does involve a character that is a drug dealer and the book can be harsh in some respect because of its language. But it was most important to me to give a Latino character a voice, especially in the street/urban lit. I felt there really wasn't one book that stood out that had such a powerful voice coming from a Latino character. And that is why I believe my book to be still different and miles apart from your standard street/urban lit. But in the end, it's really about situations and things going on that I think everyone can relate to, that HIS-PANIC has the potential to gain a wider audience. Q: What is Mafieta and how have they help your dreams come true? 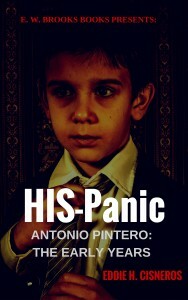 HIS-PANIC is book one in what promises to be a vibrant, violent, vivid retelling of Antonio "Ant" Pintero's life story. He begins with "The Early Years." He was raised by a heroin addict mom with Aids and an abusive drug dealing stepfather. At age five, Ant's stepfather teaches him to weigh and bag weed; by age ten, he has Ant and his "Strike Foo Crew" --a group of eight middle graders--selling for him in school to students and teachers alike. It is during these informative years that Ant starts his life of crime and learns the hard way all about trust, loyalty and revenge, but there are harder lessons to come. ABOUT THE AUTHOR: Employed as a doorman for over twenty one years, Edward Cisneros “Eddie C.” has been quoted as saying, “I am not a doorman who chooses to write, but a writer who happens to be a doorman.” Apart from his novel series, HIS-PANIC, Eddie has two finished screenplays under his belt. A stylized thriller titled BEND about New York City homicide detectives on the trial of a serial killer and its sequel. He also served as contributing writer for a real estate website with bi-weekly posts entitled, “A Doorman Speaks.” Eddie has resided in Queens, New York, for much of his life, and it is where he continues to live with his family. 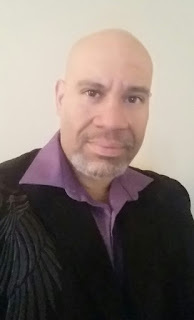 He is currently setting up a website, but he can be found on TWITTER; readers can connect by searching @EddieCauthor (Eddie C Author).